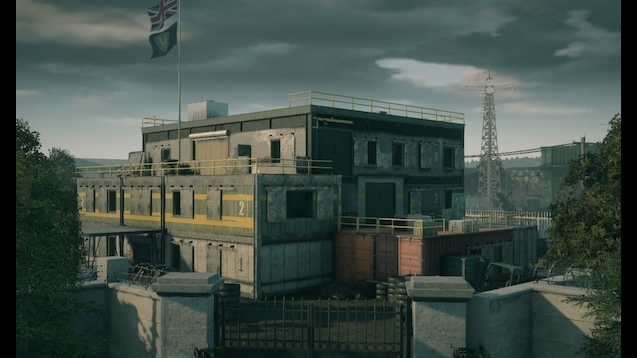 Hereford Base, the first map implemented into the dev build of Rainbow, is one of if not the most iconic map in the game. It’s CQB combat is intense and its angles long and foreboding, as I like to call it a Glaz’s paradise. The map features 4 floors with incredibly small rooms. On 1F (Ground floor) there’s a hallway that has looks in form outside (by opening the main door) all the way to the stairs (Fig 1) which, as one can an image, is a death trap for the defenders basically negating a roamers rotation back to an objective such as dining room, laundry room, Armory, Master Bedroom, Kids room, and the top floor objectives (I do not know their proper callouts). This makes the map more attacker favored there are not enough rotations for the defenders and huge angles on primary hallways, rotation areas and connection points. Another primary Problem with the map is its spawn peaking areas, there are a lot of opportunities for being spawn-peeked or spawn-peeking. This can make the their frustration for the attackers at times. Furthermore, Hereford feels like it was designed for 2 game mode — Secure Area and hostage; this makes the bomb sites on the map terrible to defend (Kids and Dining, and the Top Floor Objectives) with the only semi-viable objective being Armory and Office (even then, office is quite hard to defend). The placement of breathable walls on this map are not the best as there is an overpopulation of them, there are entire hallways that are completely made of breathable walls, but they feel very linear in there use as compared to other maps. In spite of these flaws, Hereford base is an incredibly fun map to play and is a staple of the R6 map roaster, and it is sad that it is being reworked and redone to something almost indistinguishable from the first map. I make this statement mostly because of the challenge it provides; defenders can get really creative with their use of flank roots, which can be devastating from opposing team (i.e.their the external staircase) (Fig 2). These plays make the map more fun to play on defense in my opinion (which isn’t right, attacking and defending should both be equally fun) as it makes those plays even semi-viable than they are. Lastly, the map is very new player friendly. It’s the first map that new player would play on (in the situations) and it’s layout is incredibly easy to memorize. I’m at the point where I can draw it with my eyes close (granted I’ve been playing the game for 3 years but the point still stands). Hereford is much less intimidating than other maps (not including House and Yacht to an extent) allowing New Players to focas on their Gun skill and on the fly thinking. In Conclusion, Hereford Base, we will miss you, (especially with the maze that they call a map that is going to replace you). We hope you turn into something great, we will never forget you Hereford 1.0. Press F to Pay Respect. Rest In Papa Kaplan’s arms as you transcend to Tachanka’s Server. Plays way too many games and should probably sleep more instead. Heya now i am for your key time in this article. I ran across this specific aboard i to find This process handy & the item reduced the problem out much.. Private Internet Access I am hoping to offer you one thing back plus guide other folks such as you solved the problem.